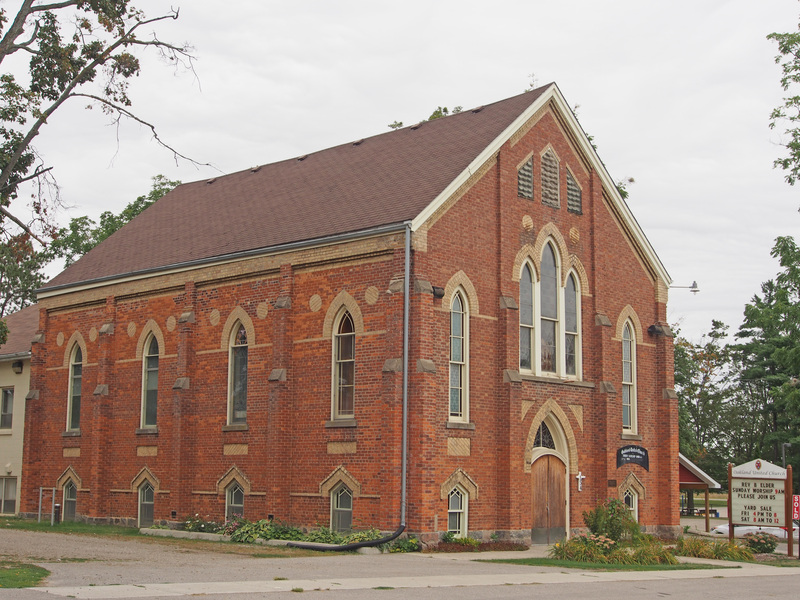 Grimsby is a town on Lake Ontario in the Niagara Region. It is named after the English fishing town of Grimsby in North East Lincolnshire. 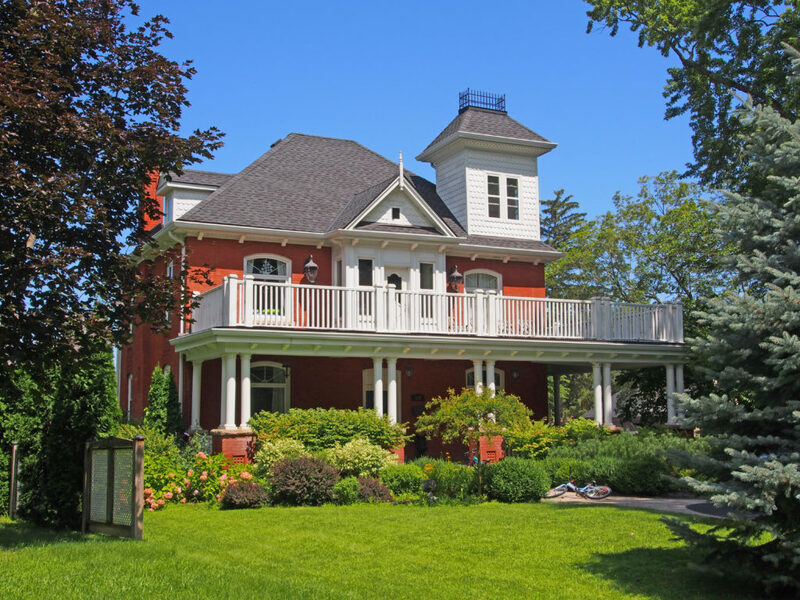 The majority of residents reside in the area bounded by Lake Ontario and the Niagara Escarpment. Grimsby has experienced significant growth over the past decade as the midpoint between Hamilton and St. Catharines. The town of Grimsby was founded in 1790 (originally named Township Number 6 and then ‘The Forty’), after a group of United Empire Loyalists settled at the mouth of 40 Mile Creek in 1787. A Loyalist from the Mohawk Valley, New York, Robert Nelles and his father and brothers were among the first to settle at The Forty following the American Revolution. Robert Nelles was a politician and later lieutenant-colonel in the War of 1812. In 1816 the village became known as Grimsby, the name of the surrounding township. 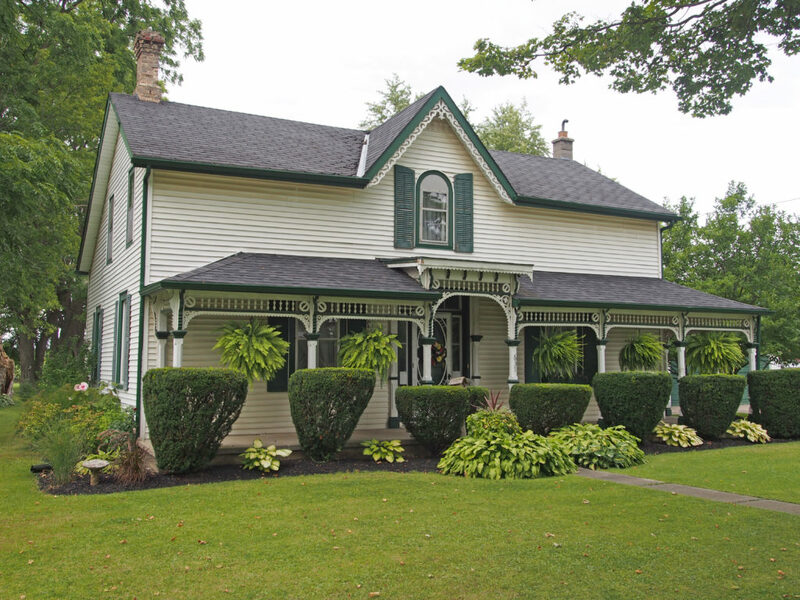 The town has gone through many changes, from being a small rural village; to a centre for the manufacture of farm machinery, hospital furniture, furnaces and other metal products; and later the hub of the Niagara Peninsula’s fruit-growing industry. Grimsby had a successful fishing industry which lasted until the 1960s. The Town of Grimsby and the Township of North Grimsby were amalgamated in 1970 with the formation of the Regional Municipality of Niagara. 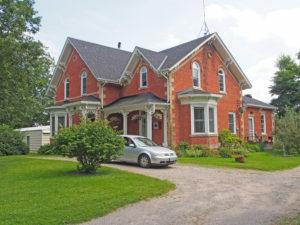 With a number of wineries and distilleries, Grimsby now serves as the starting point for touring the Niagara wine region. Grimsby is the birthplace of Hollywood director, Del Lord who rose to acclaim as the director of most of the Three Stooges short vaudeville comedies. Later, under Columbia Pictures, he directed nearly two hundred feature films. Grimsby Beach was once a major holiday resort. Grimsby Park started in 1846 as a park for the Hamilton district of the Methodist Church. In 1910, the park’s new owner, Harry Wylie, modernized the park with carousels, a motion picture theatre, and a “Figure 8” roller coaster. Operations continued until 1949, with attractions gradually closing and developers buying land to build houses. Bisecting the town is the Queen Elizabeth Way. It has three exchanges in the town, with Casablanca Boulevard in the west, a central exchange for three roads (Christie Street, Ontario Street, and Maple Avenue), and Bartlett Avenue in the east. 245 Main Street East – The first house here, called Inchyra, was built in 1846 by John Beamer Bowslaugh but was destroyed by fire in 1874 and was rebuilt as it is today. Bowslaugh was the benefactor of Grimsby Park. The widow’s walk was built around 1920. A widow’s walk is a railed rooftop platform, originally designed to observe vessels at sea. The name comes from the wives of mariners who would watch for their spouses to return. In some instances, the ocean took the lives of the mariners, leaving the women as widows; they would often gaze out to sea wishing that their loved ones would return home and the name widow’s walk was born. 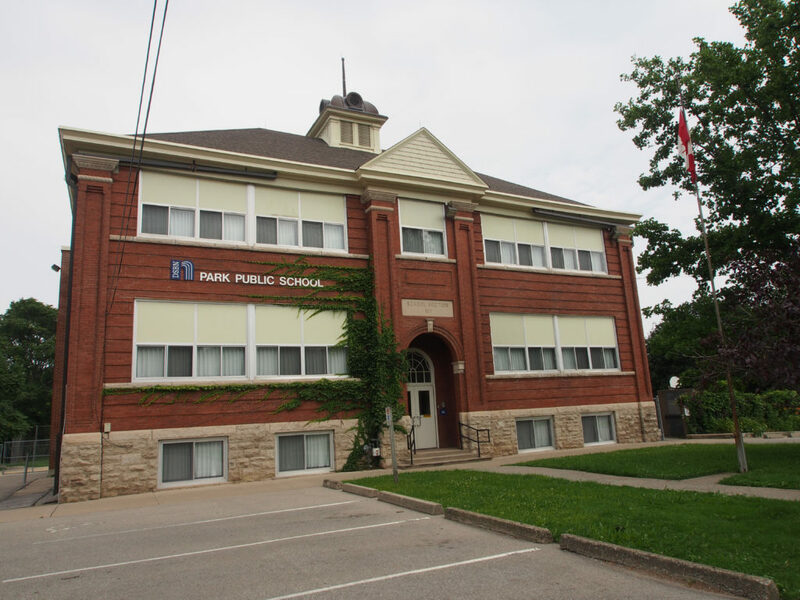 217 Main Street East – Park Public School – In 1805, School Section (S.S.) No. 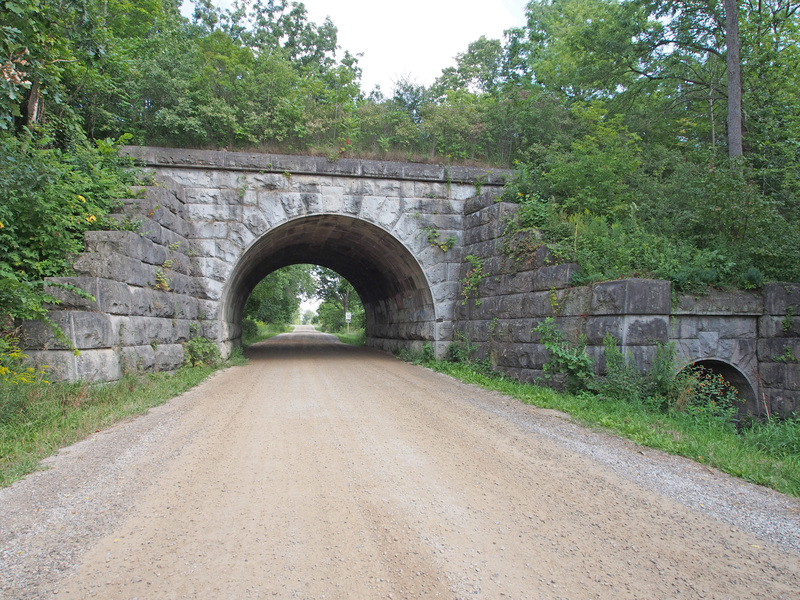 1 North Grimsby Township was built of logs on what is now known as Park Road. A frame building was erected on the southeast corner of Park Road and what is now Regional Road 81 in1825. 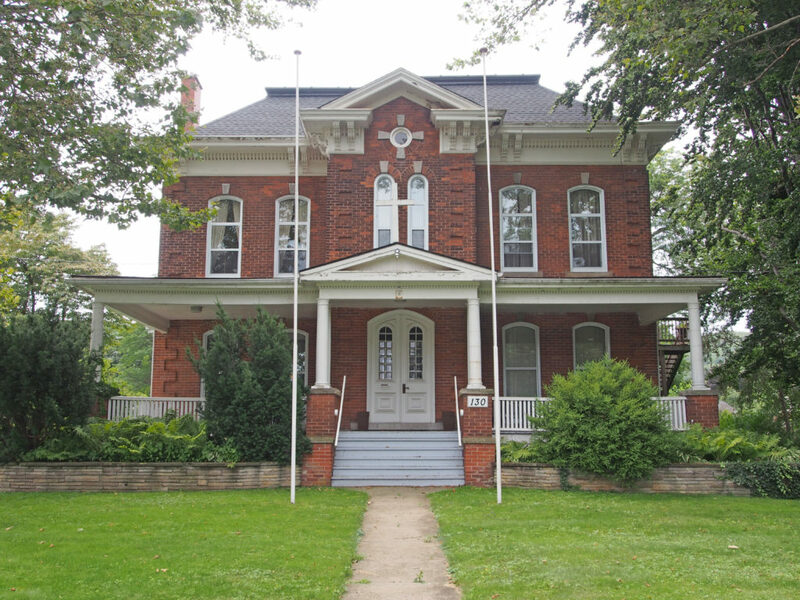 This building served as the school until 1865, when a one room red brick schoolhouse was built. The first teacher was Walter H. Nelles. In those early days, the teacher boarded with a nearby family. The teacher’s board paid for the tuition for the children in the family. Fifty cents a week was paid to the family responsible for starting the fire in the school every morning, and another fifty cents went to those who swept and dusted the school. By 1909, a larger school was needed because of the growing number of people living in the Grimsby Beach area to the north of the school. 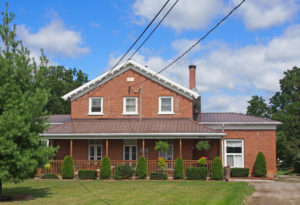 A four-room brick building was constructed on the present site on a two acre parcel of land. As the school board had decided in 1909 to build the school much larger than needed, it wasn’t until 195l that expansion was necessary. Two classrooms were added, and modern flush toilets and heating were installed. 130 Main Street East – Walter Nelles, son of Peter Ball Nelles and his wife Mary Sumner, built this Italianate style house with a hipped roof with deck, 2½-storey frontispiece, paired cornice brackets, voussoirs and keystones, corner quoins, pediment above entrance. 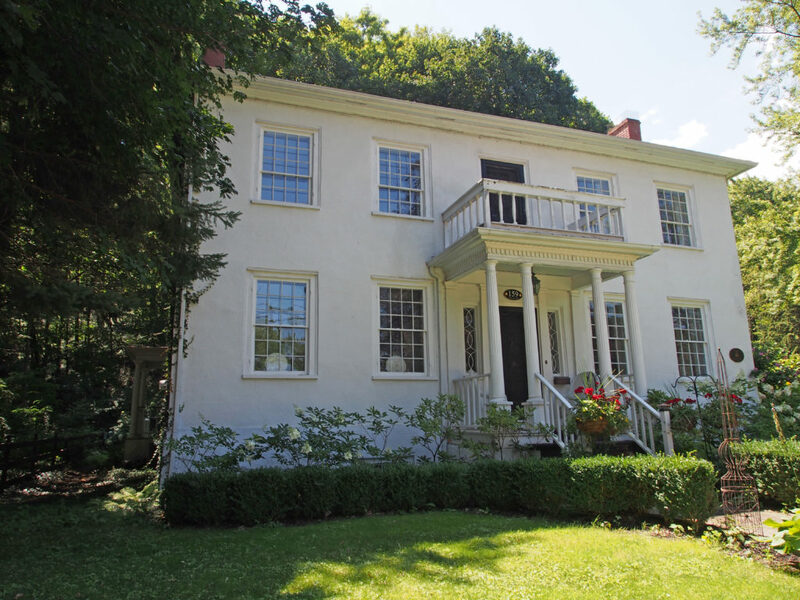 126 Main Street West – Nelles Manor is a historic home completed in 1798 by Colonel Robert Nelles, a Loyalist from the Mohawk Valley, New York. 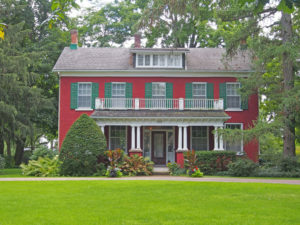 The house is considered to be the oldest inhabited dwelling between Niagara and Kingston. It was built in the Georgian style of locally quarried stone over a ten year period (1788-98). 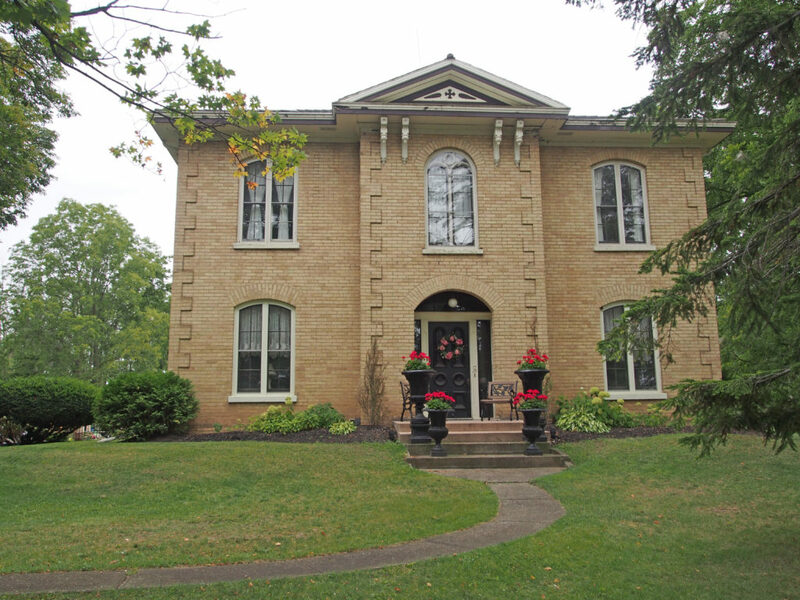 Built facing north and Lake Ontario on an old path called Squire Nelles’ Lane, the main entrance was later moved to the south on the other side, with a pillared porch facing on to the new Stone Road (now Main Street). The Neo-Classical portico was added in the early 1820s. 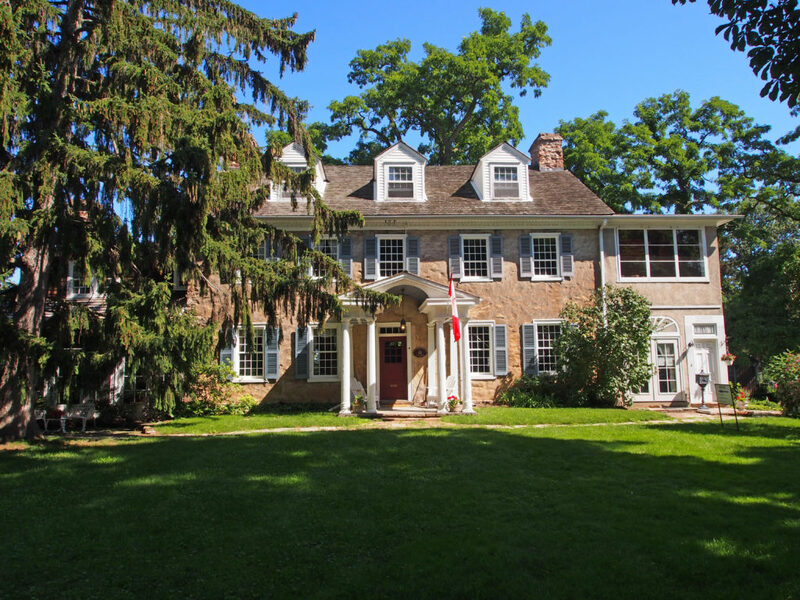 This home served as Nelles’ residence during his lengthy career as Justice of the Peace, Member of the Legislative Assembly and Commander of the 14th Lincoln Militia. Colonel Nelles’ office was a small room on the north side, where he performed many marriages before clergy were available. 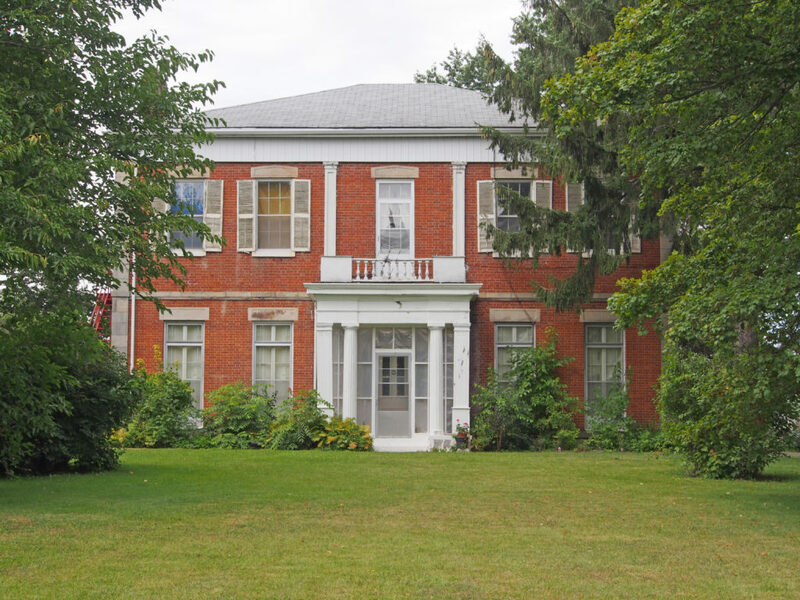 The house was a centre for gala events and remained in the Nelles family possession until 1963. It has seven fireplaces, walnut woodwork and spacious halls and rooms. 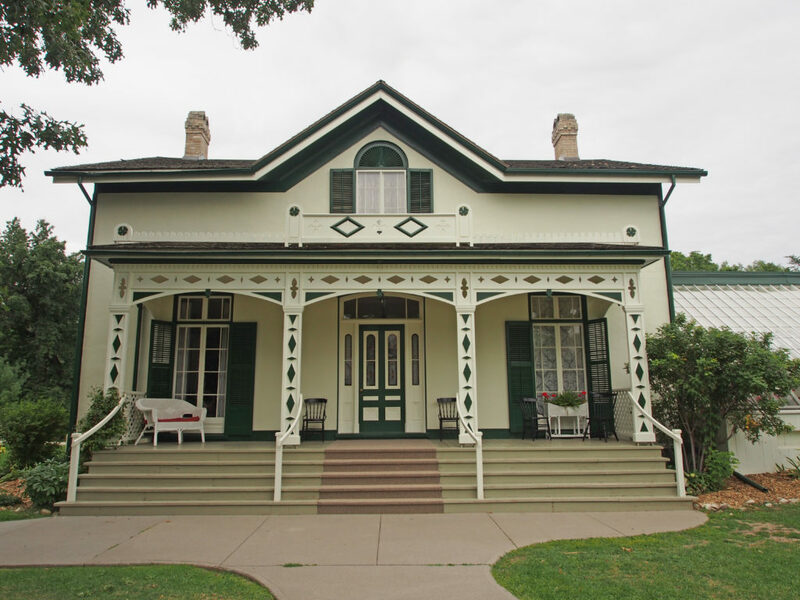 Originally a private residence, it was turned into a museum in 2016 and is now open to the public. 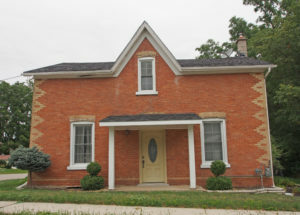 123 Main Street West – Dolmage House – circa 1876 – Robert Dolmage (1820-1889), a general merchant on Main Street, built this red brick home for his wife and daughters. After his wife’s death in 1904, the girls care was entrusted to Claude Boden, a shop assistant who had been adopted by Robert. When the last sister Florence died in 1945, she left her estate to Claude who was then free to marry his long-time fiancée Cora March, a teacher at Hagar School. The historic house now operates as The Iron Gate Retreat, a day spa. 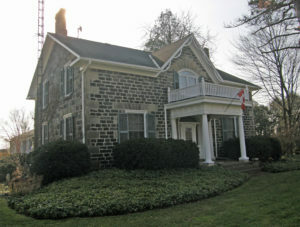 127 Main Street West – This home was originally built as Henry Nelles’ merchant shop and granary. The joinery used to build the house indicates that it was originally constructed by ship carpenters. The post and beam interior is made of lovely red pine. At one time this would have been a local gathering place as residents purchased their needed supplies. There is a cornice return on the gable. 159 Main Street West – White House was built in 1830 by John Grout for his son, Reverend George Grout. The White House is an elegant two-storey Loyalist Neo-Classical house in the Georgian style. It is a solid stone house with white plastered walls. 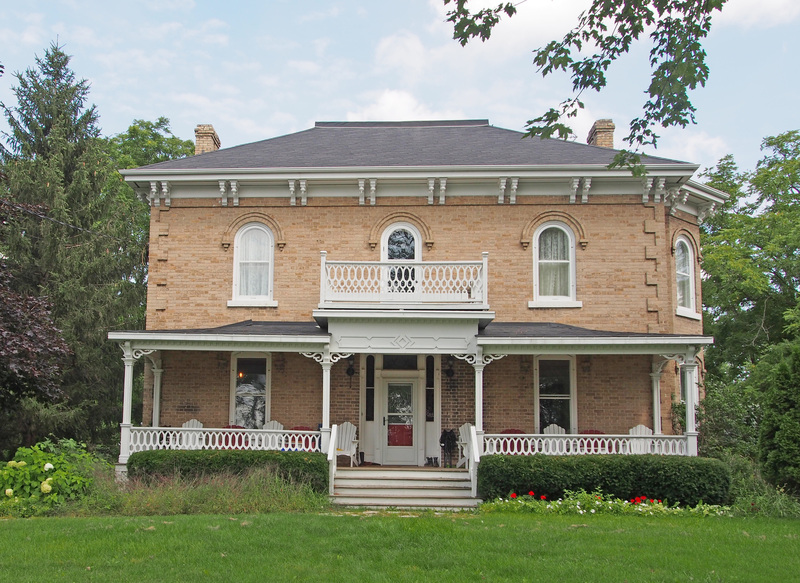 The two-tiered porch, a later addition, has four fluted Doric columns with square bases supporting the upper portion of the porch. Plain hand rails are on either side of the main entrance. More decorative balusters and molded hand rails border the upper tier. A pair of pilasters separates the sidelights from the doorway. The upper windows are in a pattern of twelve panes over eight, the lower larger sash windows are twelve over twelve. 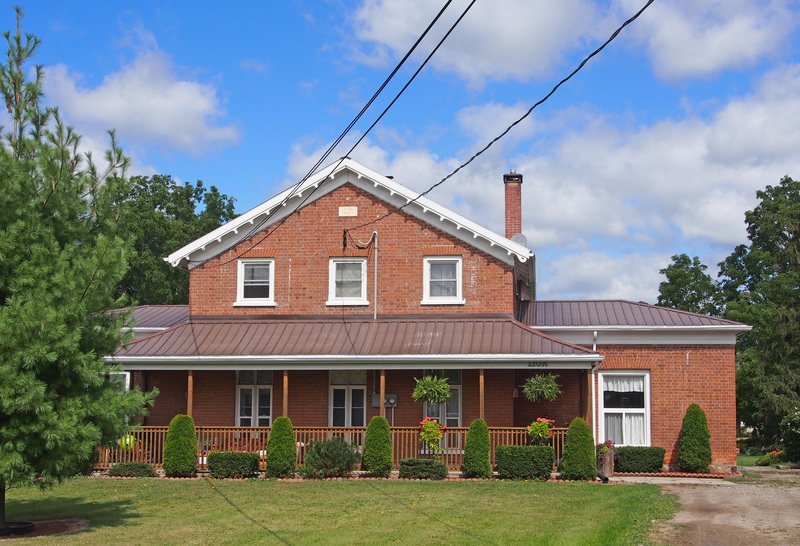 The low pitched, hip roof of the main house is trimmed by a plain fascia and molded soffit. There are three brick chimneys. 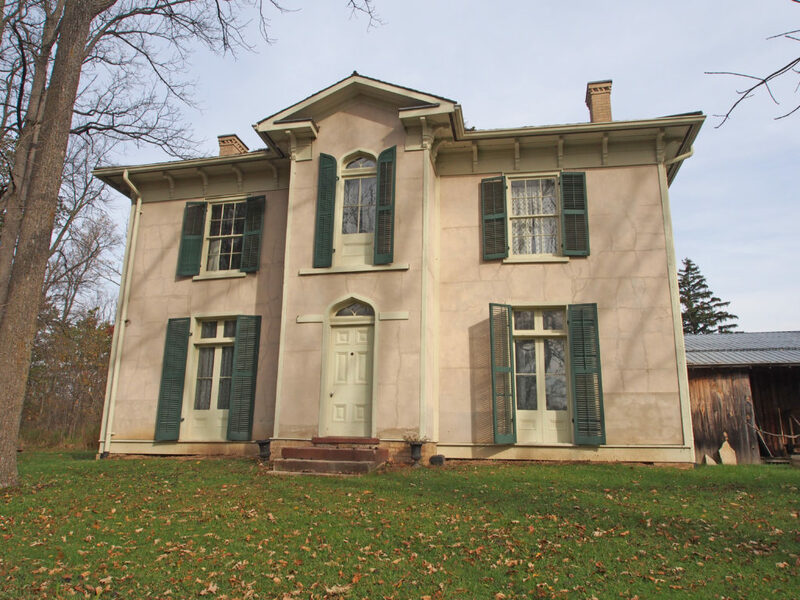 The house is said to have served as part of the Underground Railroad and a refuge for former slaves. 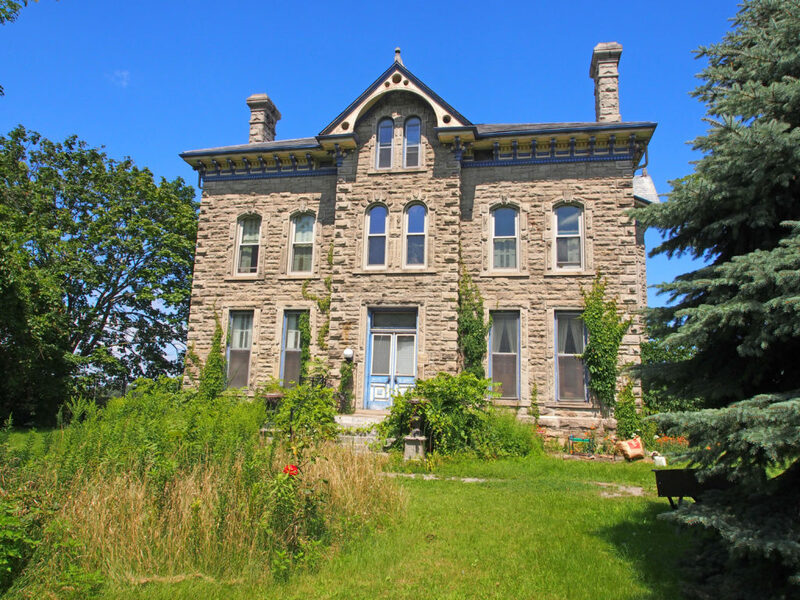 390 Main Street West – names for the house are Smith-Geddes House, Thornfield Hall, The Stone House – The two-and-a-half-storey stone building was constructed between 1876 and 1878. The Smith-Geddes House was built on a flat area of land amidst orchards of peach and cherry trees. 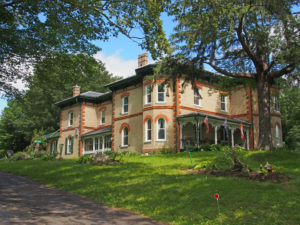 The rural location, close to Lake Ontario to the northeast and the Niagara escarpment to the southwest, creates a unique natural setting. Born in 1828, John Henry Smith was a descendant of one of the area’s earliest settlers, United Empire Loyalist John Smith. John Smith came with his wife and children to the Grimsby area in 1787, and settled on a land grant between the Niagara escarpment and Lake Ontario. 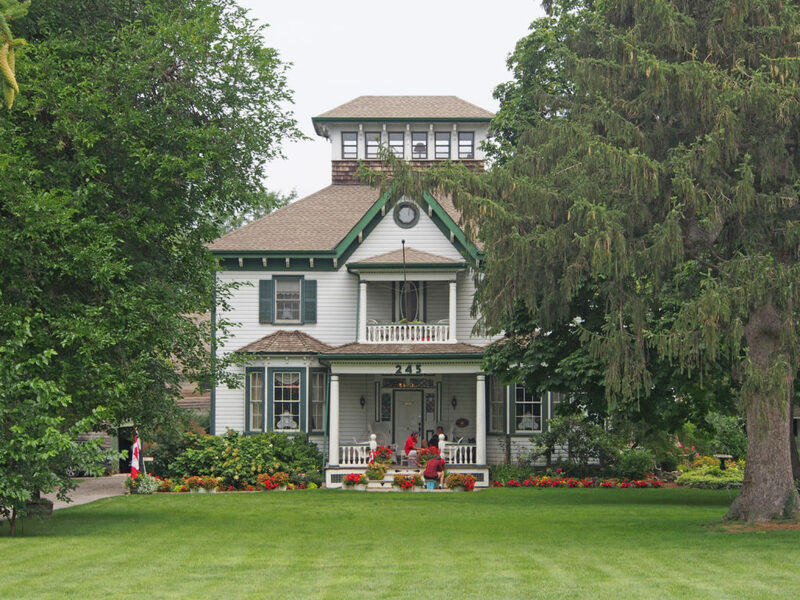 Smith-Geddes House was built for his son, John Henry Smith, a businessman and entrepreneur. Brantford Township was the largest and most central township of Brant County. The first area settled was along Fairchild’s Creek north west of Cainsville. The township was blessed with many creeks that were developed with mills. The first industrial operation in the township was a mill operated by James Percy in Mount Pleasant. The township also has fertile soil and land was quickly settled and within twenty-five years was well under cultivation and thriving. Within the township are the villages of Mount Pleasant, Burtch, Newport, Cainsville and Langford, as well as the homes of Alexander Graham Bell and George Brown, a father of confederation. 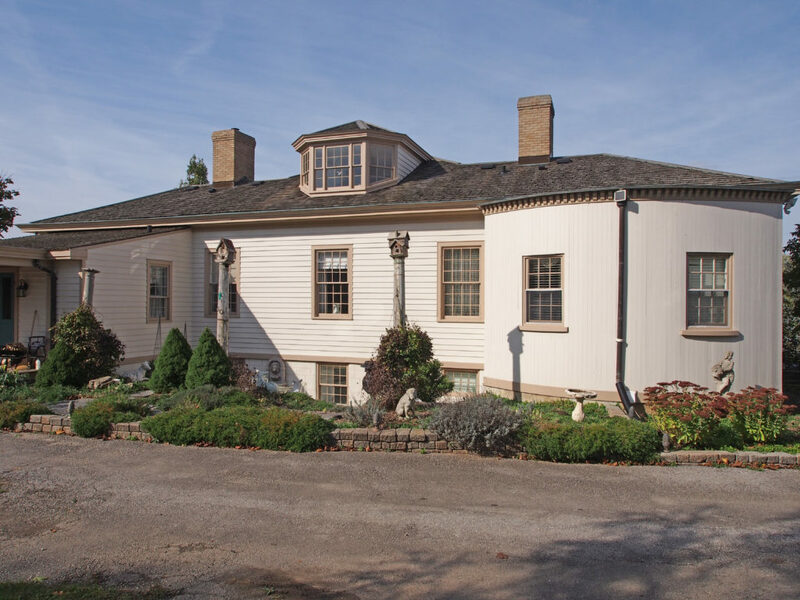 Within decades of its founding in 1799 by the Ellis and Sturgis families, Mount Pleasant was a prosperous and cultured settlement with flourishing farms, inns, mills, schools, a drill hall, and commercial establishments. Today Mount Pleasant’s long and lovely main street retains much of its rural charm and many of its old homes, churches, and farmsteads. Mount Pleasant Road is part of the Long Point Trail, an old Indian trail which went from the Grand River in Brantford south to Lake Erie. Emily Stowe was the first woman to practice medicine in Canada and also the first woman school principal. 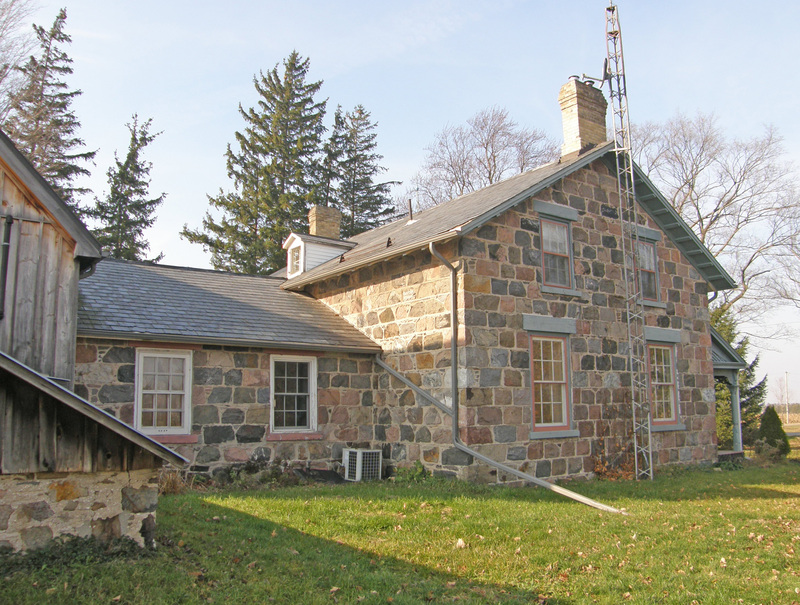 After her marriage in 1856 to carriage-maker John Stowe, she taught at the renowned Nelles Academy at 667 Mount Pleasant Road. She studied medicine in the United States because she was refused admission to a Canadian medical school. She did a lot of campaigning for increased education opportunities for women, and her daughter, Augusta Stowe Gullen, born in Mount Pleasant in 1857, became the first woman to graduate in medicine from a Canadian university in 1883. One of the earliest settlers in the area of Newport was Edee Burtch who purchased land from Joseph Brant around 1796. As more settlers arrived, the area became known as Burtch’s Landing and was later renamed Newport. Newport was laid out for settlement by Thaddeus Smith in l857. Newport was a thriving shipping port offering passenger service to Buffalo on the Red Jacket and Queen paddle wheel steamers that operated on the Grand River. There were also facilities for handling general freight. 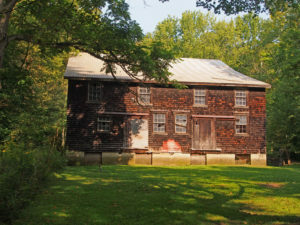 The village with several hundred people had two wagon and carriage shops, two blacksmith shops, brickyards, several general stores, a post office, two churches, a school, a tavern/ hotel, a sawmill, grain warehouses and a grist mill. The township was named for the Onondagas, a nation within the Six Nations. They settled on land granted to the Six Nations under the Haldimand Proclamation of 1784. The Grand River, which forms the southern boundary of the county of Brant, was the main artery for transportation, communication, and economic sustenance. Today this river is mainly used for recreation. 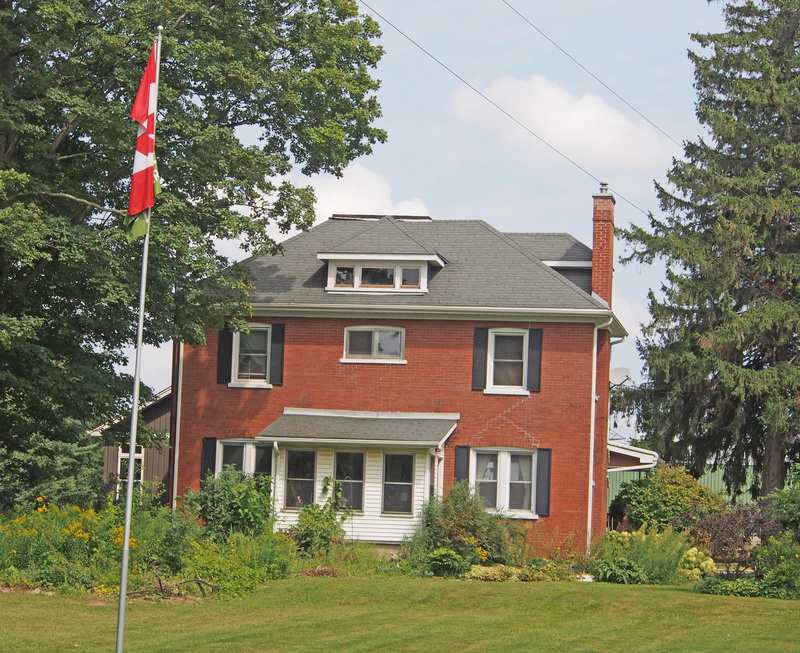 In the 1830s settlers began moving into this rich agricultural area. This Village of Onondaga was first known as Smith’s Corners for David Smith who operated a grocery store and a saloon. The name was later changed to Onondaga. 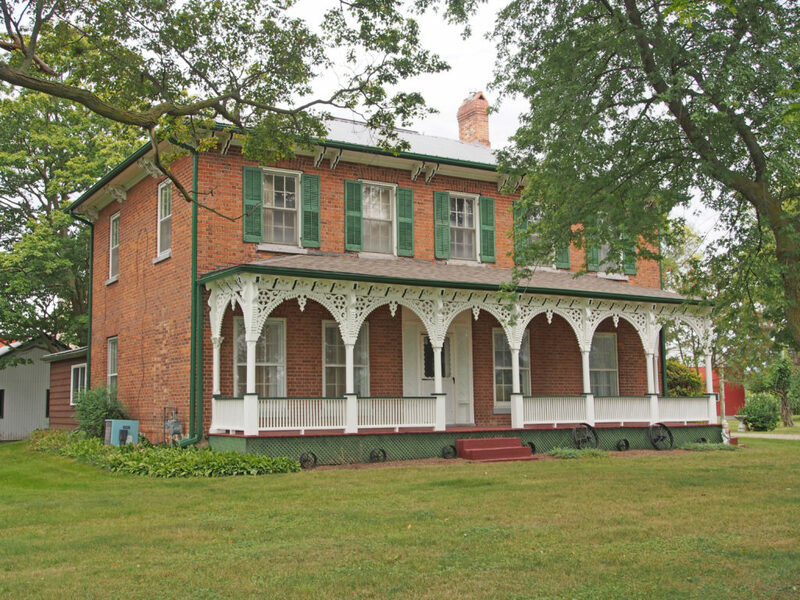 The village became a thriving community in the mid-19th century because of the Buffalo, Brantford, and Goderich Railway station located here. Schools, churches, hotels and taverns, grist and sawmills, blacksmith shops, stores and small manufacturing shops developed. The Grand River Navigation Company played an important role in the establishment of the Village of Middleport. On November 7, 1848 navigation was opened on the Grand River from Brantford to Dunnville through a series of locks and dams. Middleport, founded by John Solomon Hager, was midway between the locks at Brantford and the Village of Caledonia making it an important port. 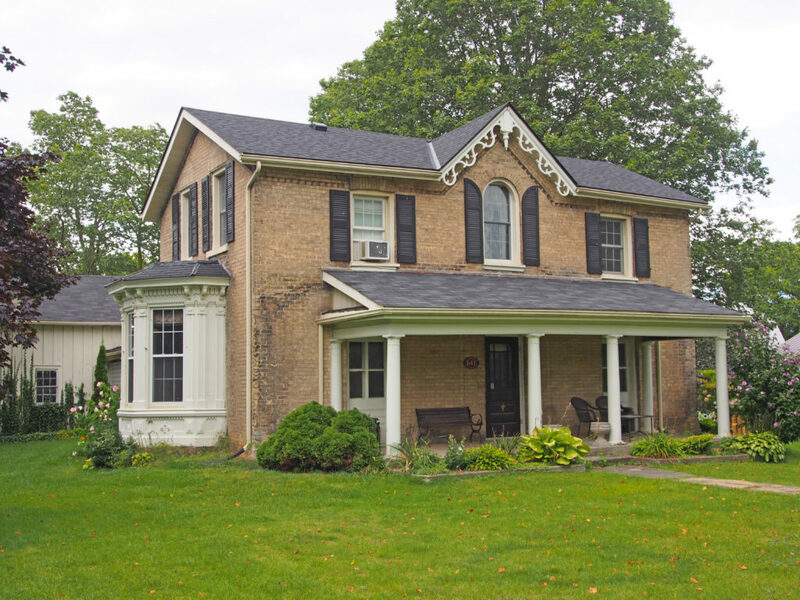 849 Mount Pleasant Road – circa 1850s – Italianate home – Archibald McEwen, a prosperous farmer and merchant, had a store on the same property. 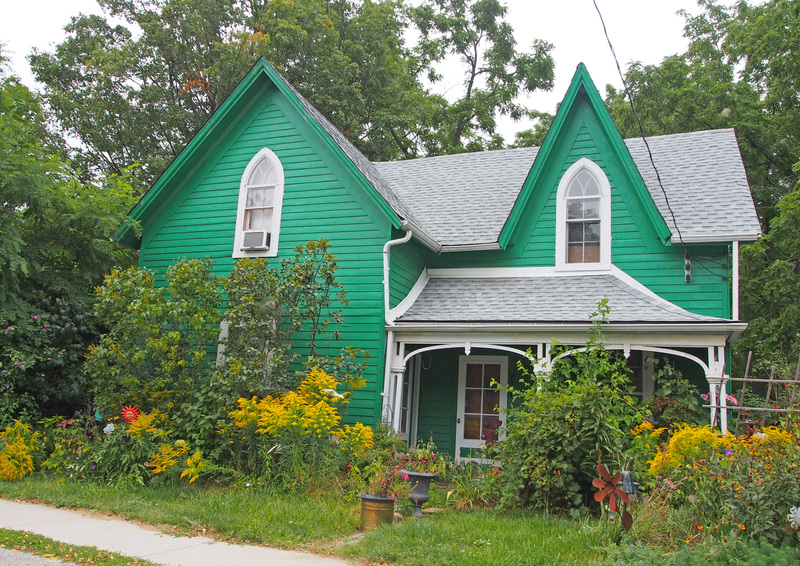 726 Mount Pleasant Road – circa 1870s – Owned by Dr. Duncan Marquis, a highly-regarded local doctor, this charming vernacular frame house in the unusual dormer style was probably built in the 1870s and is essentially unaltered. 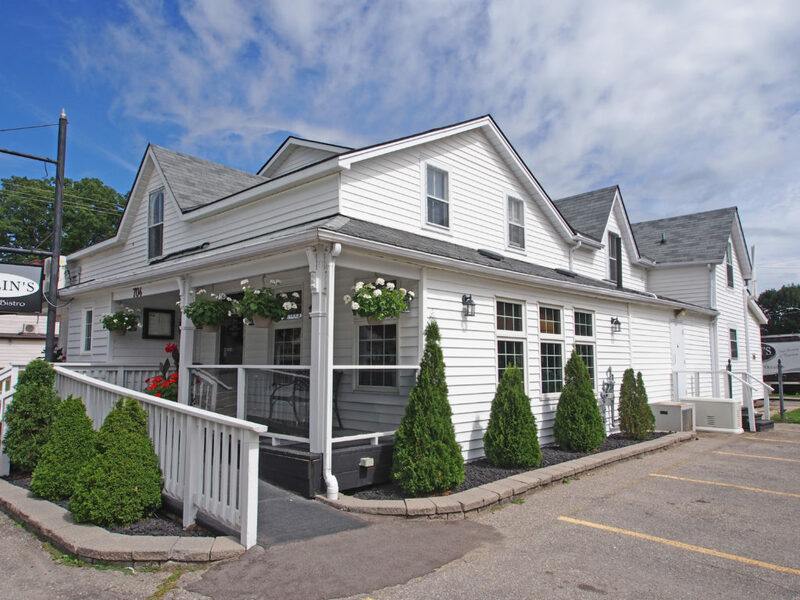 704 Mount Pleasant Road – Devlin’s Country Bistro – 1834 – This Neo-Gothic former general store and post office has been a landmark in the village since it was built in 1834. 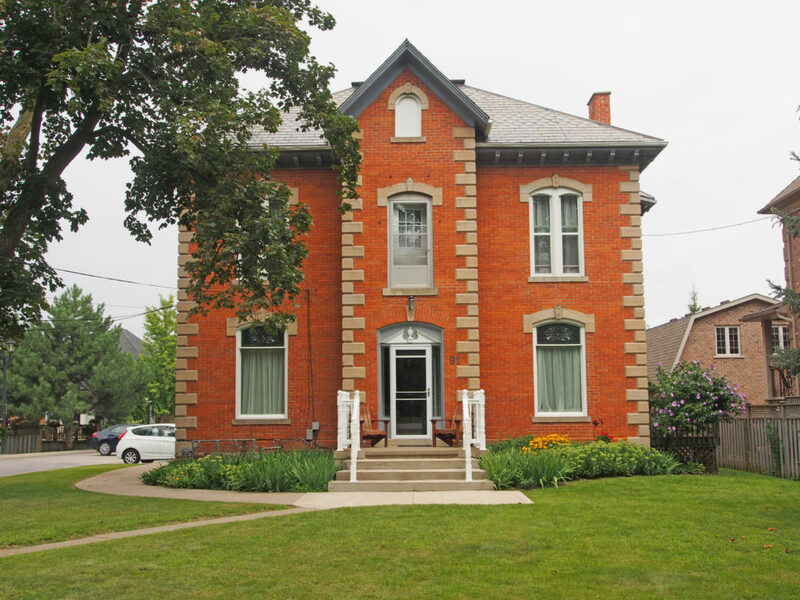 It is the birthplace of Arthur Sturgis Hardy, a prominent lawyer and the fourth Premier of Ontario. 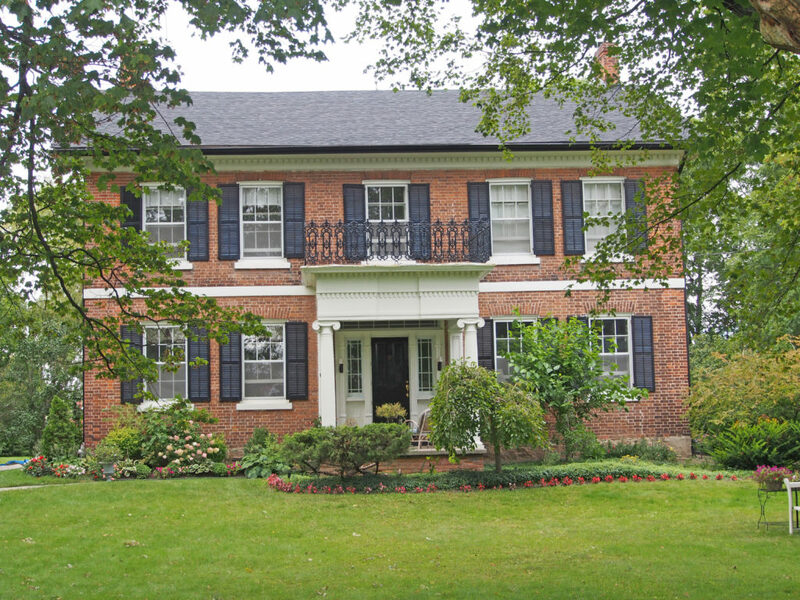 657 Mount Pleasant Road – Abraham Cooke built this Georgian/Greek Revival mansion circa 1840. 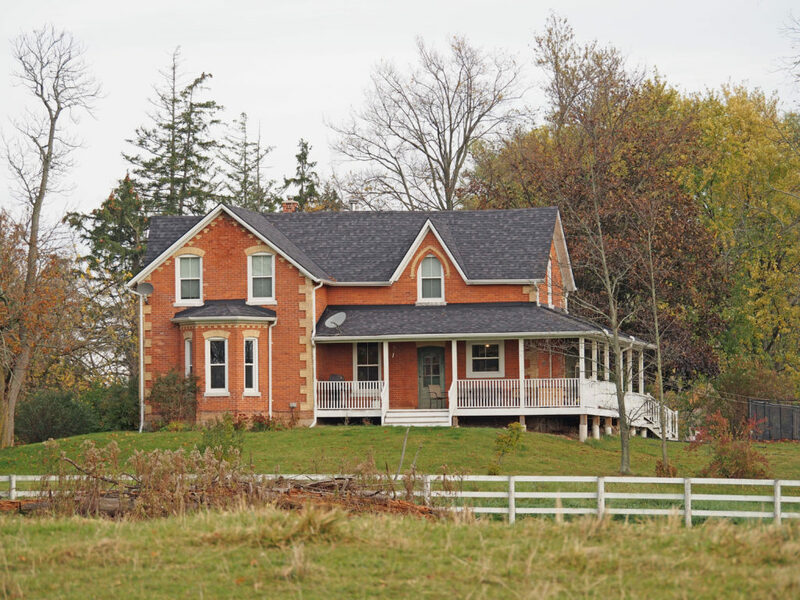 When Lieutenant Governor of Upper Canada Lord Elgin visited in 1846, he was so impressed he asked for the privilege of naming it “Brucefield” after his family. 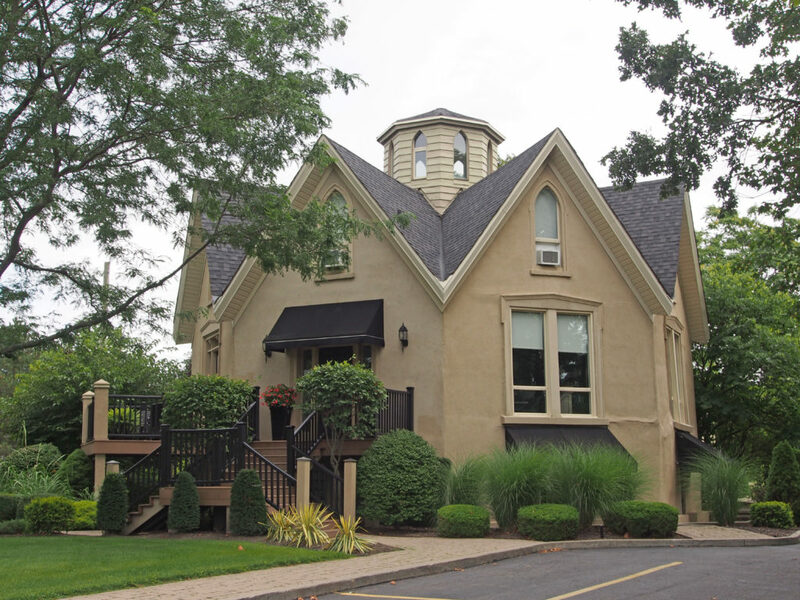 646 Mount Pleasant Road – Scape Spa – This circa 1850 Neo-Gothic style octagon is the only survivor of three similar buildings in Mount Pleasant. Shoemaker Richard Tennant took eight years to build it. Belvedere on the roof. 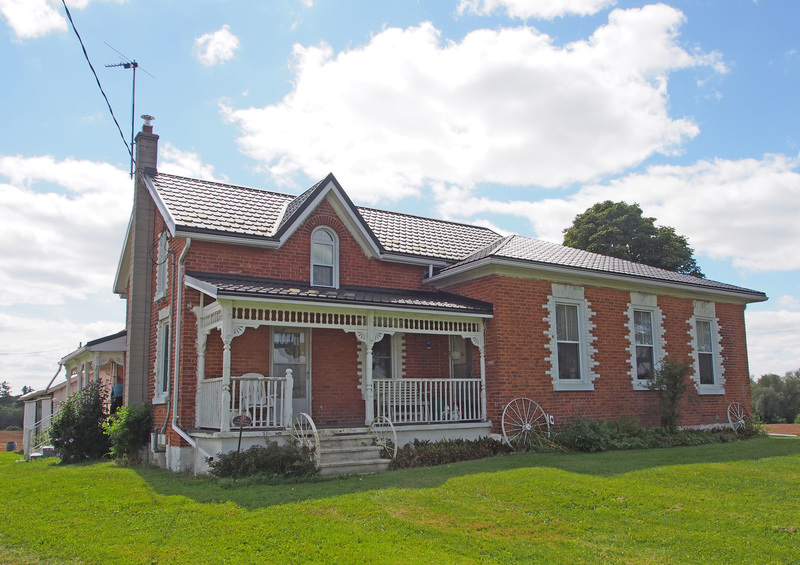 641 Mount Pleasant Road – This farmhouse was built in 1860 in distinctive Regency style evident in the long front windows in fitted panels. The bay window has Victorian details. 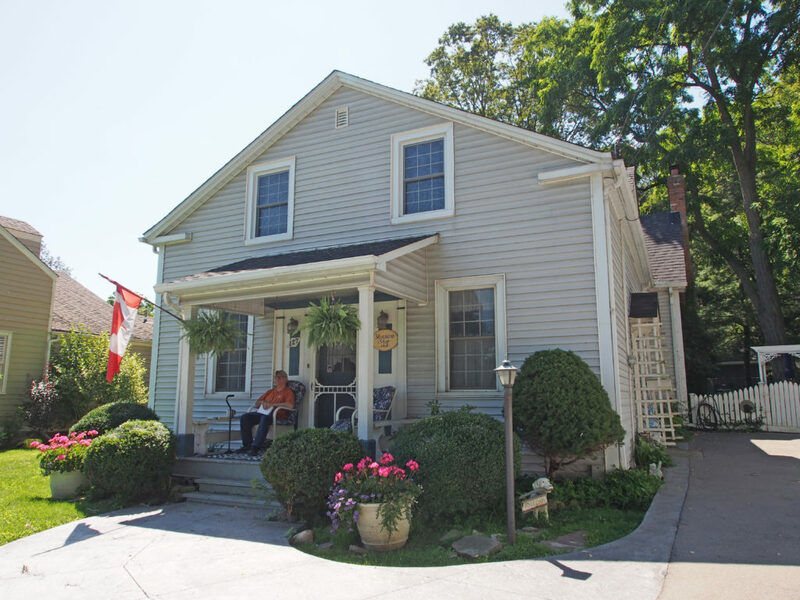 Both the Phelps and McAllister families have a multi-generation history in the village reaching back to the early 1800s. 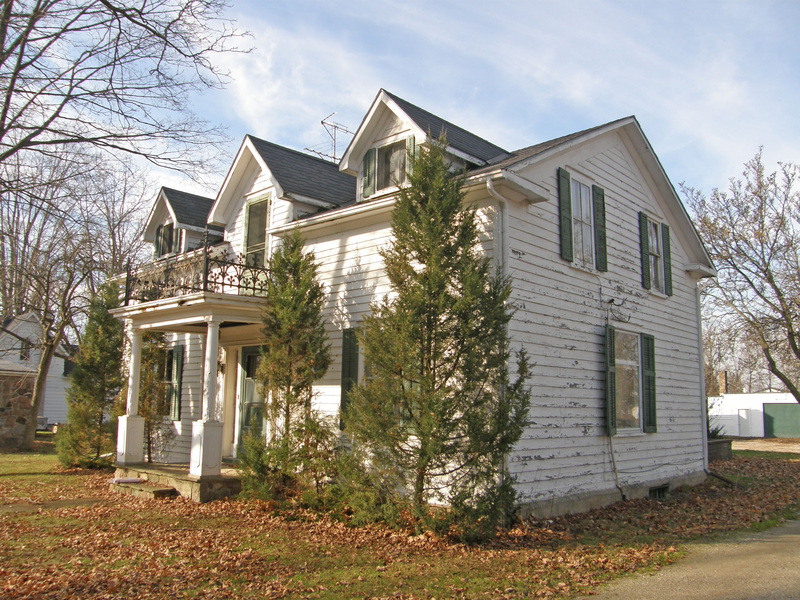 637 Mount Pleasant Road – Emily Townsend House, circa 1860s – Alvah Townsend built this house for his daughter. 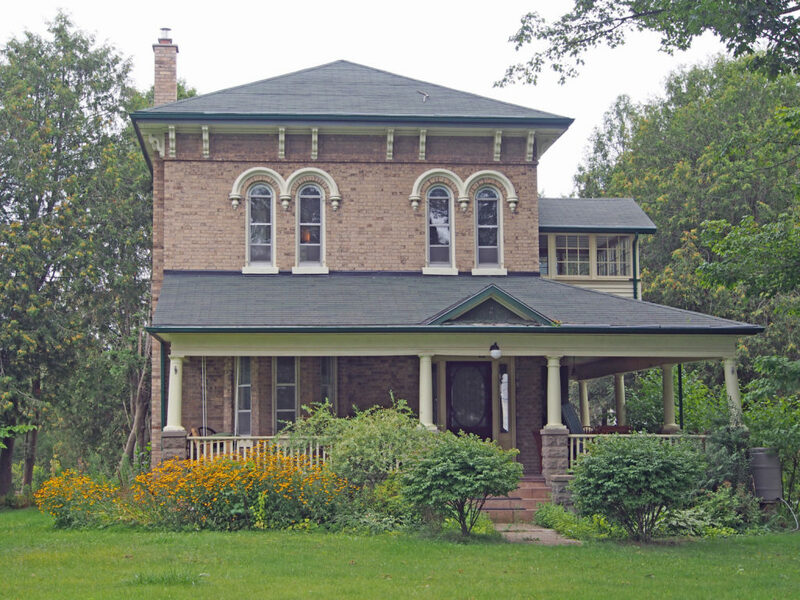 It is a Neo-Gothic style home which has been well maintained. 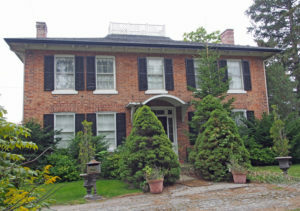 597 Mount Pleasant Road – Georgian Revival built circa 1848 for landowner and carriage maker Alvah Townsend. The style exhibits the horizontal profile and symmetrical arrangement of doors and windows. 538 Mount Pleasant Road – The Phelps-Guest House, circa 1840s, was built in three stages. 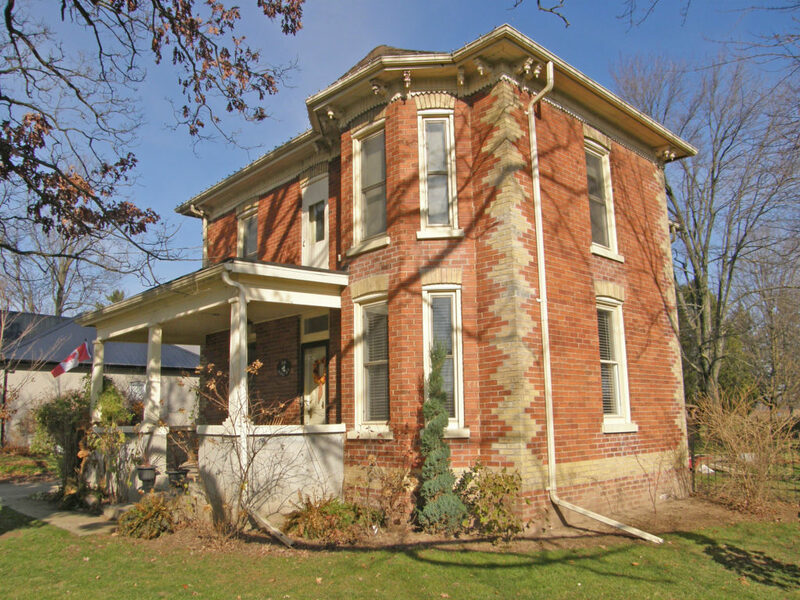 The original home was of stone construction with a board and batten addition to the rear and a buff brick Italianate addition added to the front in the 1880s. 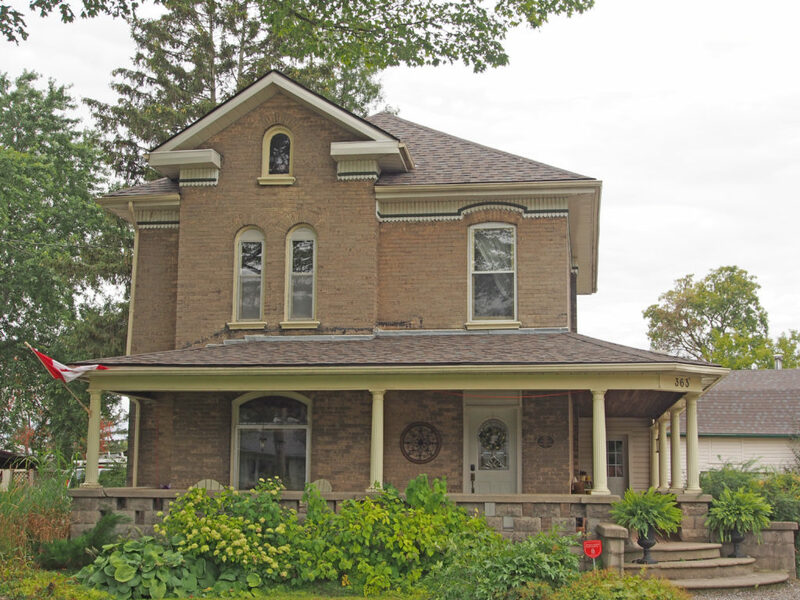 94 Tutela Heights Road – The Bell Homestead was built in 1858 by the original owner and builder Robert Morton. It was here on July 26, 1874 during his summer vacation that Alexander Graham Bell discovered the fundamental concept for the telephone. He returned to Brantford from Boston, Massachusetts in September 1875 at which time he drafted the patent specifications for the device. In 1876 Bell set up and completed the world’s first long distance telephone call between Brantford and Paris. The homestead evokes the formative influence of Bell’s father, an authority on the acoustics of speech, and of his mother who was deaf. They stimulated their son’s lifelong interest in teaching the deaf to speak, a passion that proved crucial to the discovery of the telephone. 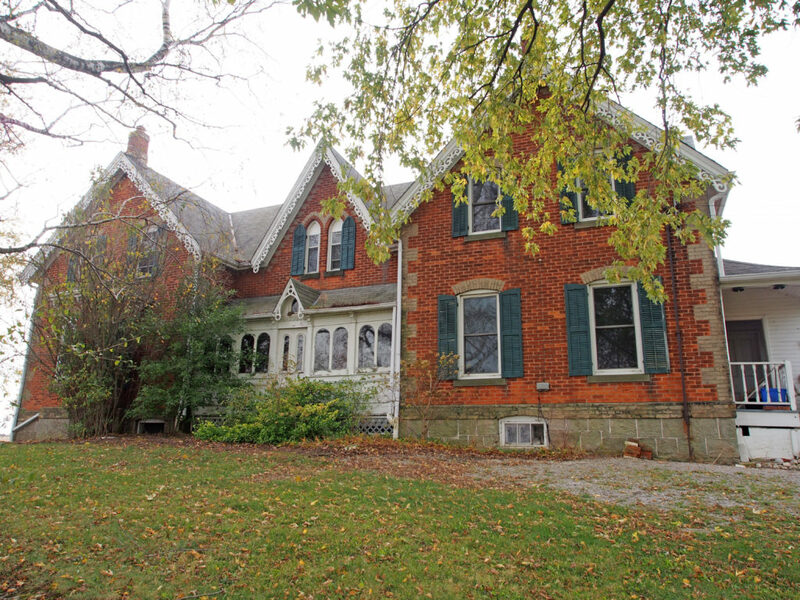 255 River Road, Newport – The Thomas house was built in 1835 at 1030 Colborne Street East by Captain Joseph Thomas on land purchased by his father John Thomas who helped build the Mohawk Chapel. John was a close friend of Captain Joseph Brant. The walls are one foot thick and the double-stud main frame is made of 12” x 12” beams. Massive fireplaces were built up from the lower level indicating that the masons did this work before the framers began. 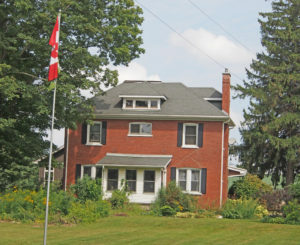 In 1993, to make way for development on Colborne Street, the house was cut in half and moved to where it sits today on top of the small hill on River Road. 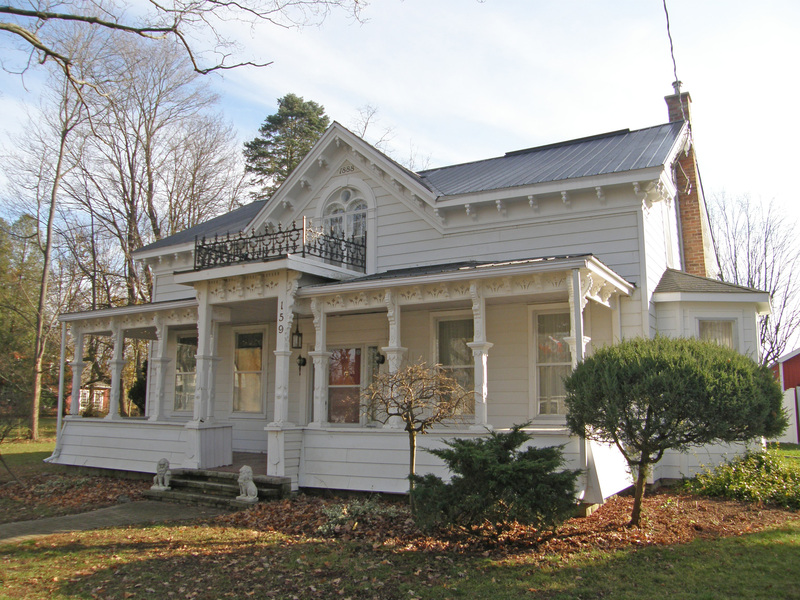 The owner has lovingly been restoring this home to its former glory. 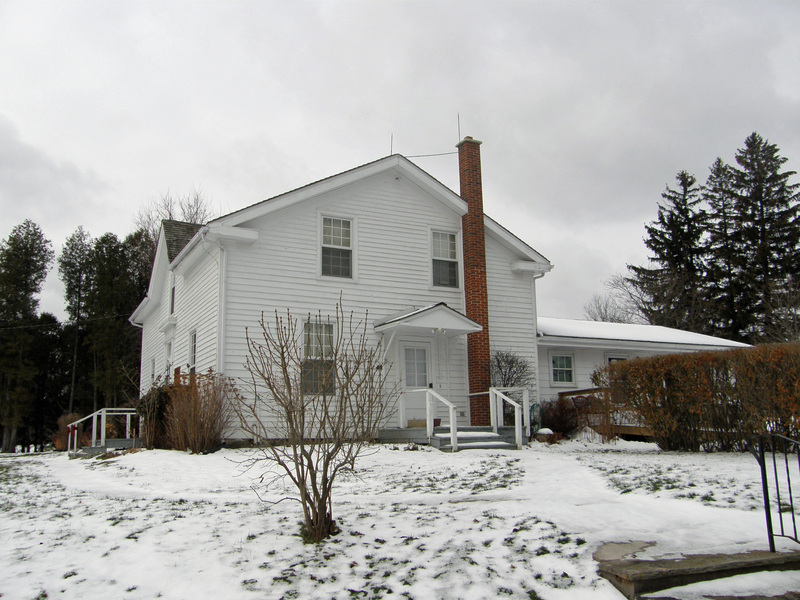 291 Baptist Church Road, Middleport – Howden Home and Barns, 1883 – In 1856, Thomas Howden and his wife Jane came from Ireland and purchased this 100 acre farm. Their eleven children grew up here. There are 14 rooms, 3 sets of stairs, and more than 50 windows and doors. 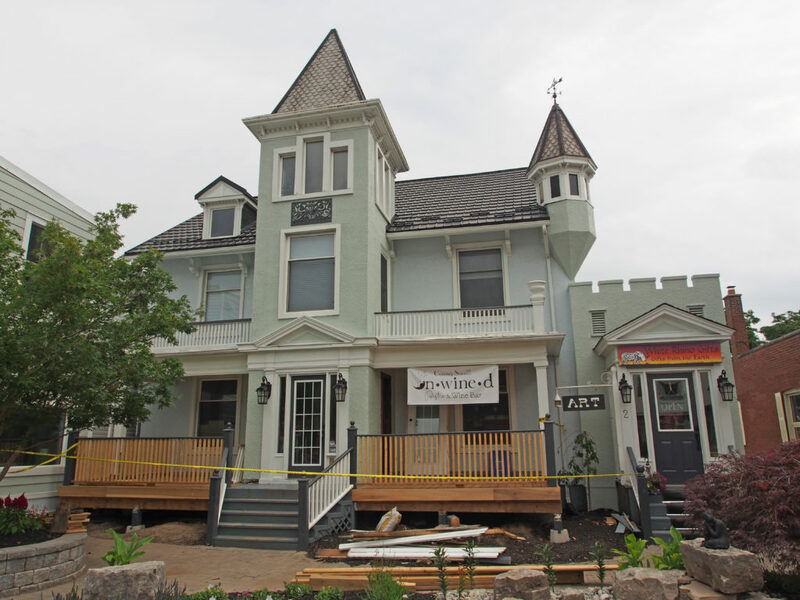 Three gables trimmed bargeboard contain Gothic windows. 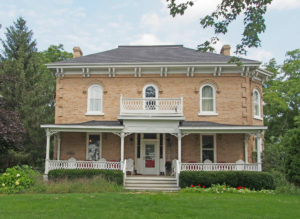 The front and side verandas are enclosed with pairs of rounded arched windows and the small gable on the front veranda contains a tiny Gothic window. Quoins accent the corners of the house. 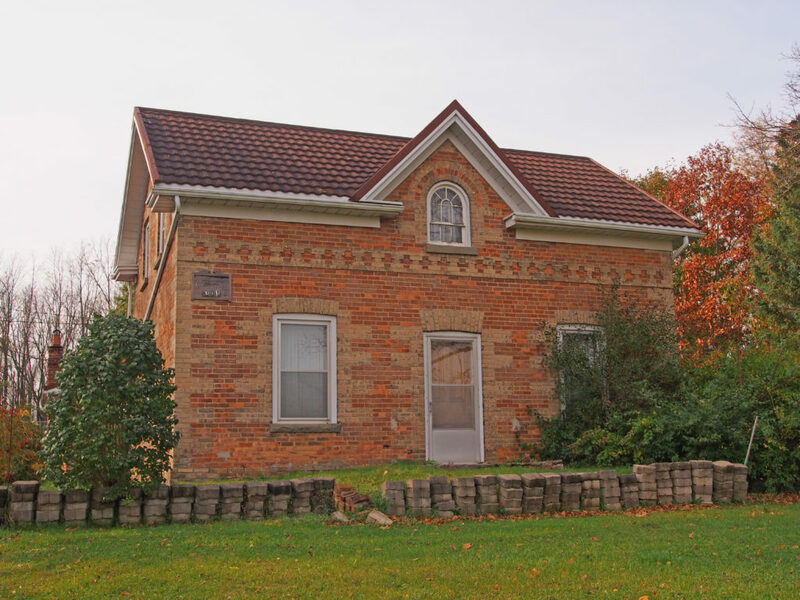 301 Big Creek Road, Middleport – Cherwell House, circa 1850s – 1½-storey brick farmhouse – buff brick quoins on the corners, buff brick highlights around windows and door and a frieze at the top of the first storey elevation. Burford is in the County of Brant and is located eight kilometers west of the City of Brantford along Highway 53, and seventy kilometers east of London. 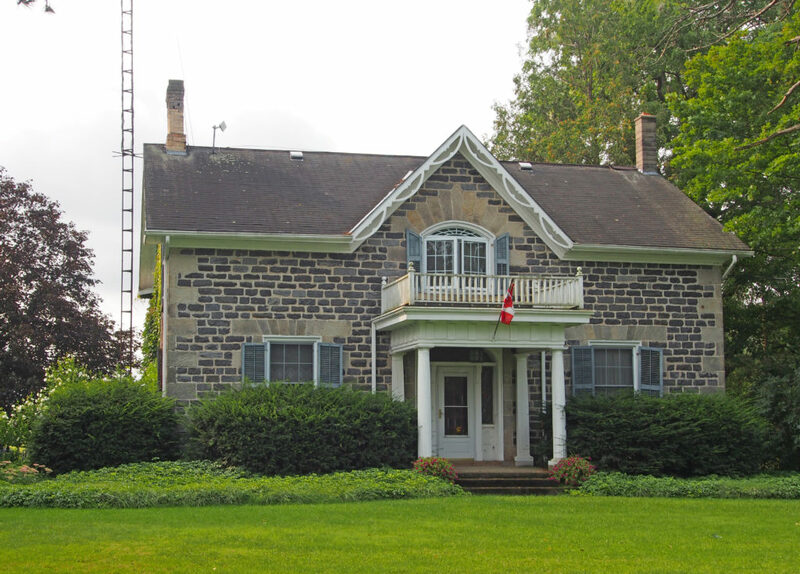 In 1793 Lieutenant-Governor Simcoe granted to Abraham Dayton the entire Township of Burford. Dayton was a native of Milford, Connecticut. The township was to become the “new Jerusalem” for a religious sect with which he was affiliated. Dayton broke his ties with the sect and settled just west of the present village of Burford. He was responsible for bringing several families into the township and by the spring of 1797 the new settlement consisted of twenty-one families. Abraham Dayton died March 1, 1797 after a prolonged illness. 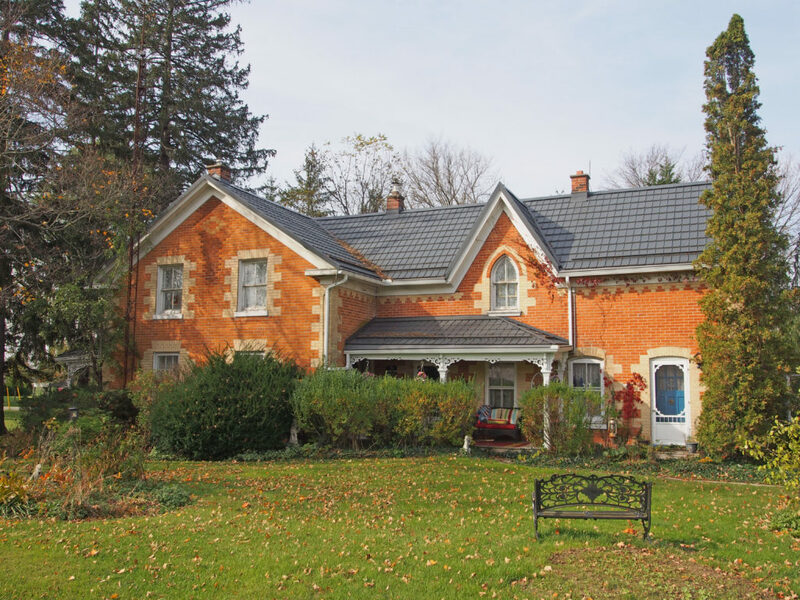 Abigail Dayton, Abraham’s widow, later married Colonel Joel Stone and moved to Gananoque where she lived until her death in 1843 at the age of 93.The Dayton’s only child, Abiah, was the wife of Benajah Mallory and she and her husband followed her parents into this township. Benajah Mallory became a man of considerable influence and by 1805 was elected Member of the Legislative Assembly of Upper Canada representing Norfolk, Oxford, and Middlesex. In June 1812, war was declared against Upper Canada by the United States. During the course of the war, Mallory accepted a commission in the U.S. forces and was considered a traitor back home. Benajah Mallory became outlawed and his land was forfeited to the Crown. John Yeigh, his wife Mary and their children Jacob, John Junior, Adam,Henry and Eva arrived in Burford from Pennsylvania by covered wagon in June1800. 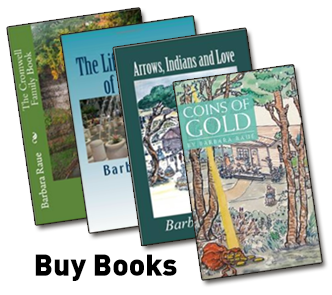 The family cleared land, farmed and established the first pottery in the Burford area. Jacob and Adam distinguished themselves in the War of 1812 and were also active participants in the 1837 Rebellion. Mount Vernon was originally named Springfield and subsequently Chequered Sheds because the posts were painted in black and white checkerboard fashion to mark several parking spots for rigs at the hotel across from Kenny’s Store. The present name, according to oral history, was given by a railway company in honor of the home of George Washington, the first president of the United States. Thomas Perrin laid out the village. He established the first store in 1835, built the first sawmill in 1840 and the first gristmill in 1845. Bishopsgate is located on Highway 53 between Mount Vernon and Burford. Langford is located on Highway 2/53 east of Fairchild’s Creek about three kilometers east of Cainsville. The village was named for Jacob Lang, an early settler who came from Pennsylvania to this area bout 1807. United Empire Loyalists settled here in the late 1700s. Several streams flowing south gave power to saw and grist mills in the area. A brickyard and a blacksmith shop were established here. The first post office was called Lang’s Ford as all of the travelers had to ford the swampy stream in the hollow just east of Jacob Lang’s farm. Later the name was changed to Langford. 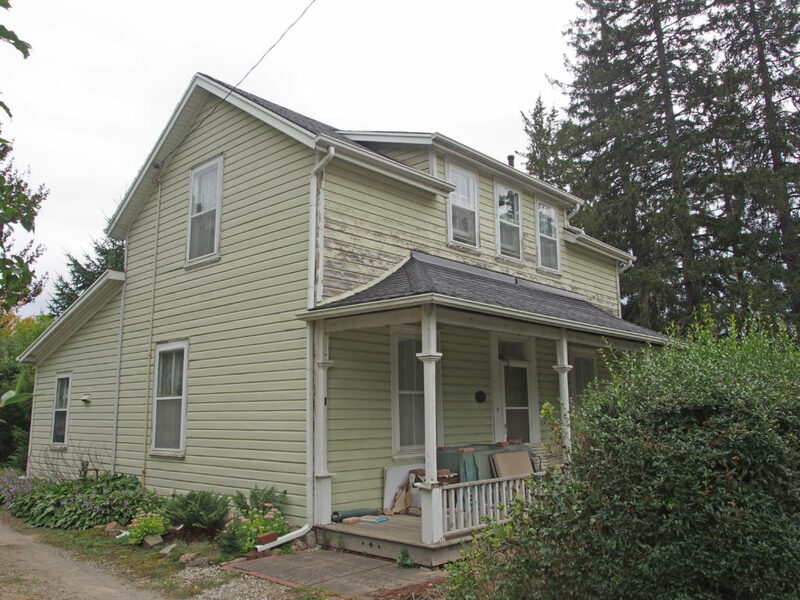 363 Maple Avenue South – built in the Queen Anne style by George Holt with a wraparound porch with wooden pillars. 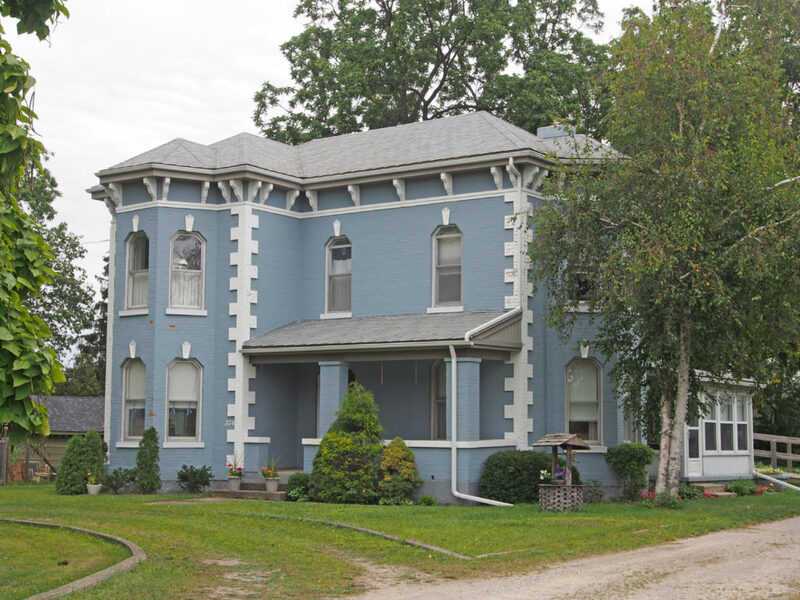 The upper storey has a bay window with one gable and cornice returns and rounded windows. There is decorative fretting under the eaves. 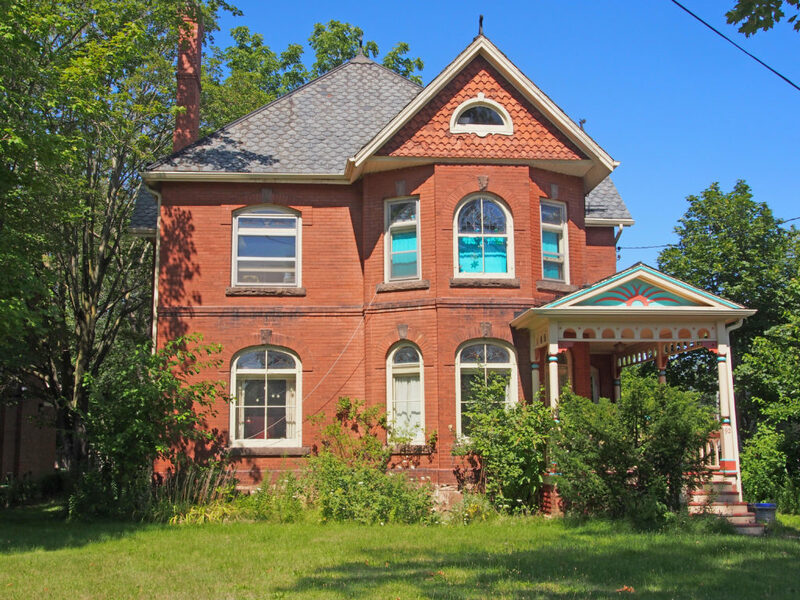 114 Fairfield Road – 1891 – Jacob Williams built this house of red brick with a slate roof, beautiful stained glass windows and decorative brickwork over and under the windows. 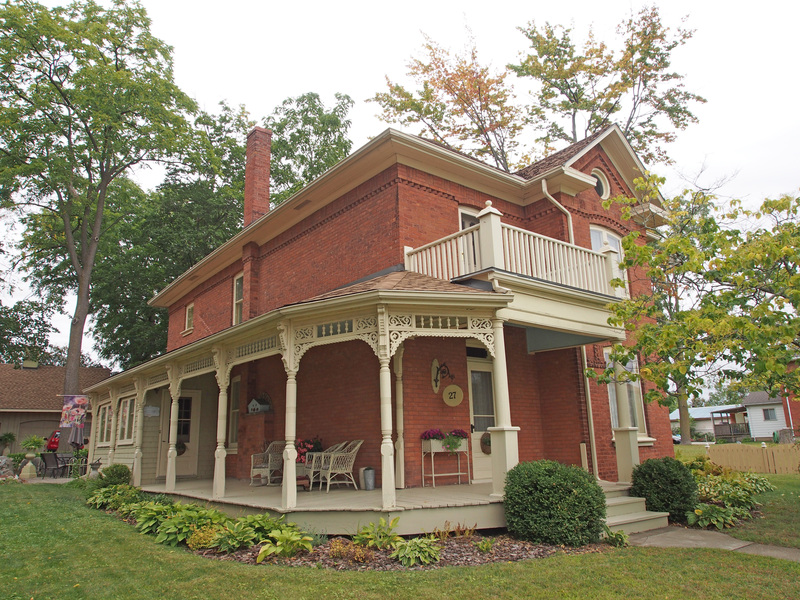 Front and side porches are original. 270 Bishopsgate Road – This Georgian house has elaborate porch arches and gingerbread with intricate fretwork. The windows are six over six panes. 300 Bishopsgate Road – 1860 – This house has a beautiful field stone façade with extensive use of finely dressed limestone quoins, lintels and window labels. 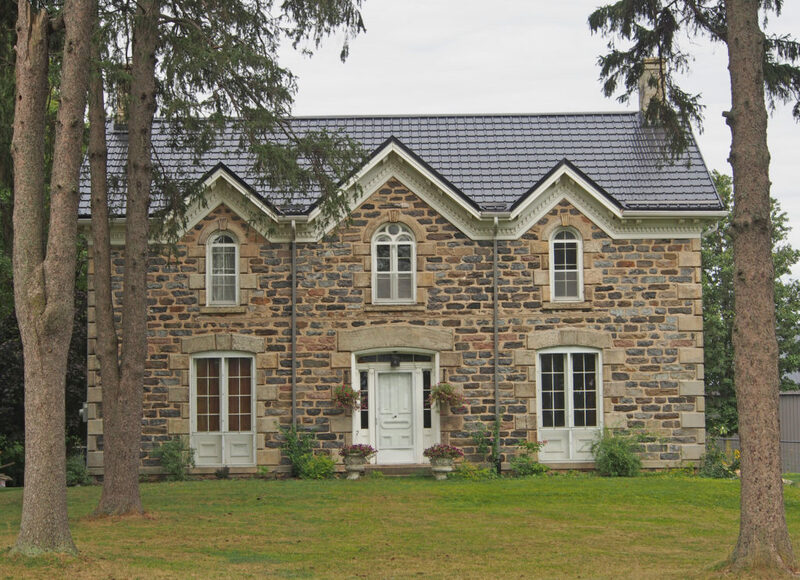 In 1793 Lieutenant-Governor Simcoe granted to Abraham Dayton the entire Township of Burford. Dayton was a native of Milford, Connecticut. The township was to become the “new Jerusalem” for a religious sect with which he was affiliated. Dayton broke his ties with the sect and settled just west of the present village of Burford. He was responsible for bringing several families into the township and by the spring of 1797 the new settlement consisted of twenty-one families. Abraham Dayton died March 1, 1797 after a prolonged illness. Abigail Dayton, Abraham’s widow, later married Colonel Joel Stone and moved to Gananoque where she lived until her death in 1843 at the age of 93. The Dayton’s only child, Abiah, was the wife of Benajah Mallory and she and her husband followed her parents into this township. Benajah Mallory became a man of considerable influence and by 1805 was elected Member of the Legislative Assembly of Upper Canada representing Norfolk, Oxford, and Middlesex. In June 1812, war was declared against Upper Canada by the United States. During the course of the war, Mallory accepted a commission in the U.S. forces and was considered a traitor back home. Benajah Mallory became outlawed and his land was forfeited to the Crown. John Yeigh, his wife Mary and their children Jacob, John Junior, Adam, Henry and Eva arrived in Burford from Pennsylvania by covered wagon in June 1800. The family cleared land, farmed and established the first pottery in the Burford area. Jacob and Adam distinguished themselves in the War of 1812 and were also active participants in the 1837 Rebellion. 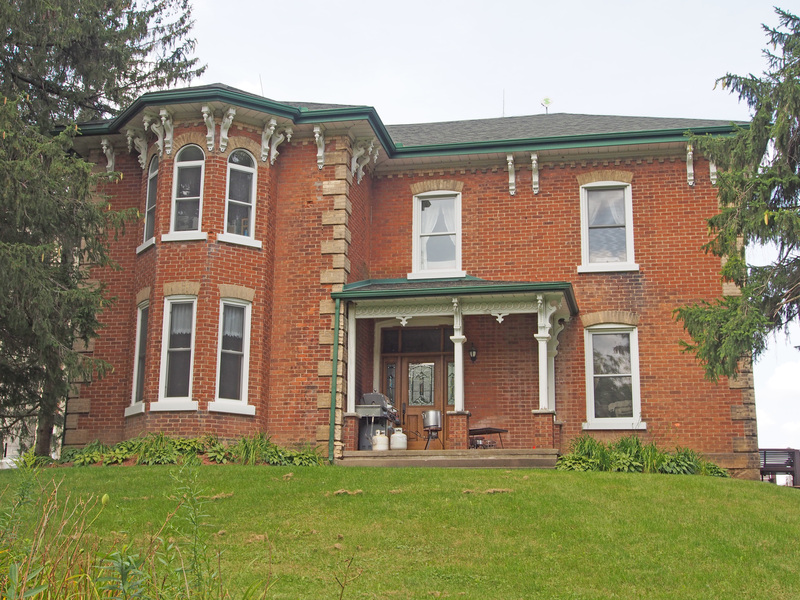 378 West Quarter Townline Road – Heritage Property – This house has Roman influenced windows with alternating brick to simulate quoining and geometric shapes such as diamonds in the apex of the gable ends. 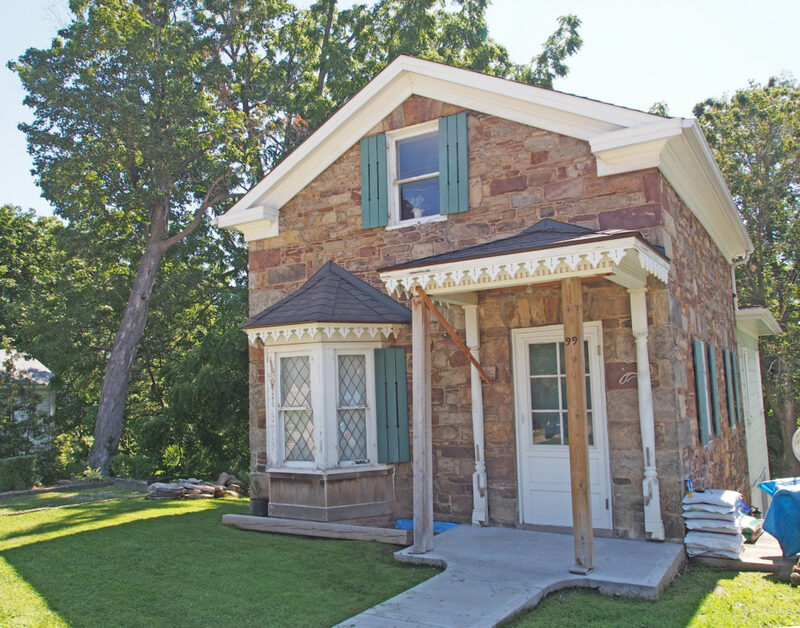 It has three gable ends and both a front and side porch. 110 King Street – Dr. Hervey Ross House – 1851 – It is usually called “The Miller House” and is a rare example of a Regency winged temple building. It is called a “winged plan” because it has a one and a half storey central body with flanking one-storey wings. Decorative features are fancy verge board along the front gable and French casement style windows. 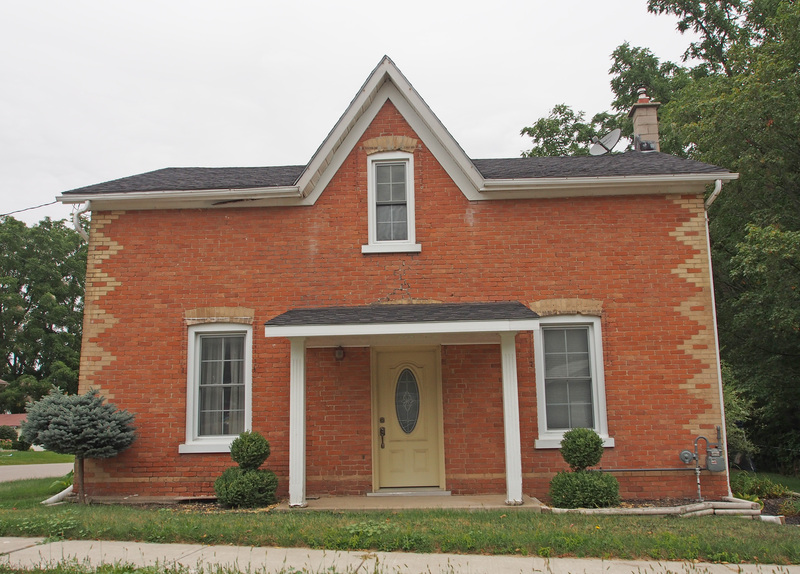 126 King Street – Post Office – A.D. 1914 – Two-storey smooth red brick structure has ashlar stone lintels and string courses at the window liens. It is sometimes called Edwardian in style because it was built during the reign of King Edward VII. The clock tower is a landmark for the business district. 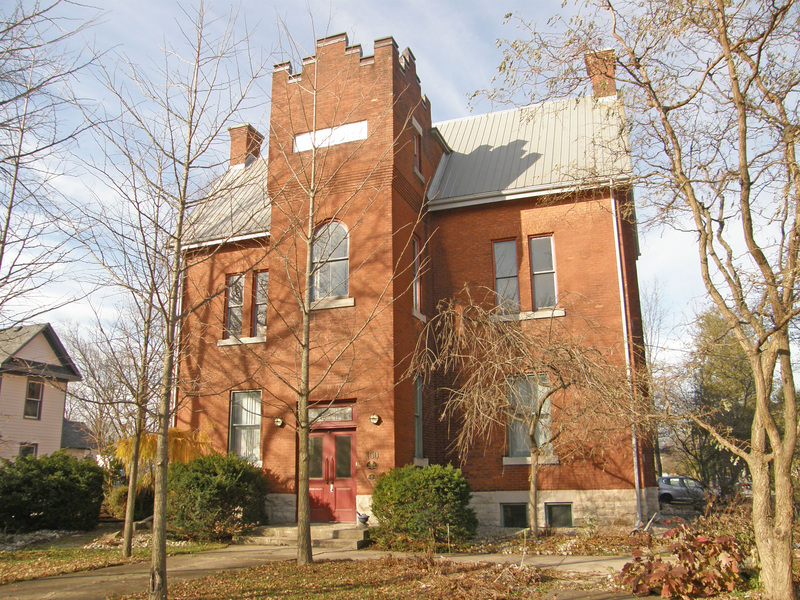 150 King Street – Armoury – 1906 – The central tower has a Roman arched window and Gothic detail as well as battlementing. The double front doors have a stained glass transom. It was used by the 1st Cavalry 2nd 10th Brant Dragoons for training and recreation. It served as a hospital during the flu epidemic of 1918 and a temporary high school in 1921. 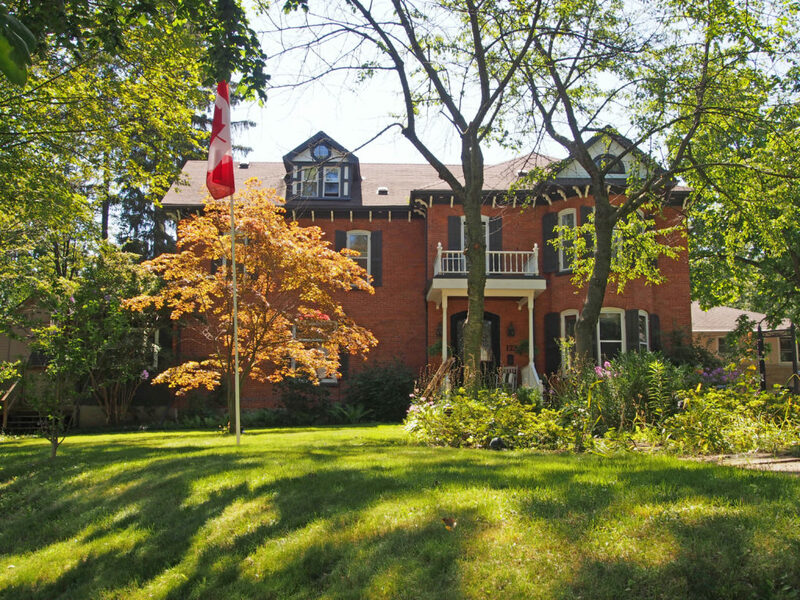 During the War of 1812, Burford became an important post, being located between Ancaster and Detroit. The military parade ground was located on this property and occupied most of what is now the residential block between William and Jarvis Streets. 155 King Street – Heritage Property – c. 1835 – Sprowl House – Doric columns support a sleeper veranda used on hot summer nights. The six over six windows are original. 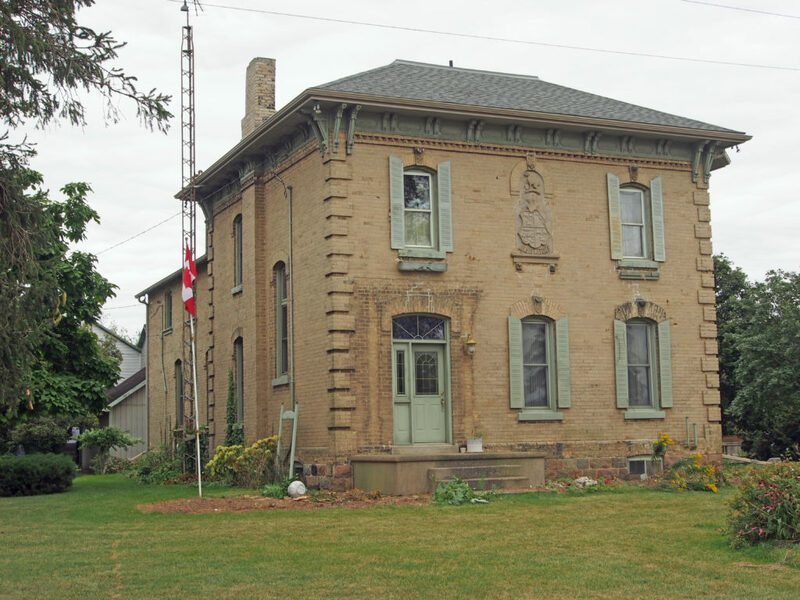 This is the former home of A.D. Muir who was active in the militia and joined the Burford Troop of Cavalry in 1881. In 1813, following the defeat of the Canadians at the battle of Moraviantown (west of London), General Proctor persuaded a group of nearly 3000 native warriors and their families to retreat with him to a powerful for, which he claimed to be at Burford. Some of this group encamped her (across from the military parade grounds) while the rest of the group was located west of the village by the creek. 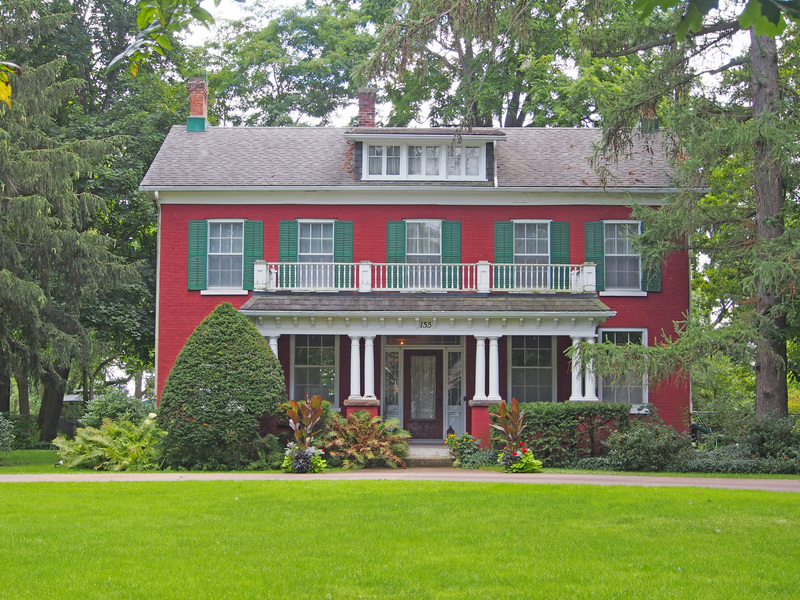 55 Maple Avenue North – Stuart House – 1886 – was built by Elijah Stuart in the Georgian Symmetry style with Italianate features, segmental arched windows, double brackets under the eaves and quoining on the corners. 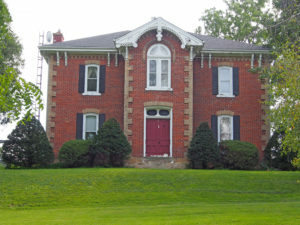 The double-hung front door has a fanlight and the second floor door has a keystone arch linking the same color detail line across the front of the house. The County of Brant is located at the mid-point of the Grand River as it flows south from Luther Marsh to Lake Erie. The community around Bethel Road with Rest Acres Road to the east and Bishopsgate Road to the west was settled in the 1830s. The major industry in this area was farming. Some of its first settlers were the Gurneys, McAllisters (wagon maker), Aulsebrooks, Lovetts and Major Arnold Burrowes whose 1,000 acre estate was known as Strathmore. On his estate Major Burrowes constructed a mill dam, stock pens, hop mill, a distillery, a grist mill and a plaster mill. The Township of Oakland includes the towns of Scotland and Oakland. It has a rich history. Scotland is located on the Burford/Oakland township line. The village was surveyed and laid out by Eliakim Malcolm. The first hotel opened in 1830, the first story in 1837 and the first post office in 1855. Malcolm’s Creek had enough waterpower to sustain several industries such as a woolen mill, gristmill, tannery and foundry. Other early industries were a cooperage, a wagon and carriage works, carriage and buggy works and a starch factory. Two doctors and a lawyer practiced in Scotland in the mid-1800s. The Village of Oakland is located three kilometers east of Scotland on the Oakland Road. Oakland was named for a ridge of oak trees that ran through it. In 1850, the first municipal office was at the Oakland Post Office. 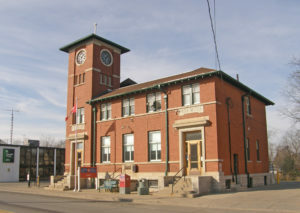 A town hall was built in 1854 and Council met there until the early 1900s. Oakland had a grist mill in 1806, saw mill in 1807, a cheese factory, cider mill, three general stores, a shoemaker, harness maker, and a hotel. Oakland is the site of the Battle of Malcolm Mills which was the last land battle of the War of 1812 on Canadian soil against an official foreign power. The battle took place at the stream that runs through Lion’s Park. In October 1814, an invading American force of about seven hundred men under Brigadier-General Duncan McArthur advanced rapidly up the Thames Valley. He intended to devastate the Grand River settlements and the region around the head of Lake Ontario, which supplied British forces on the Niagara Frontier. McArthur reached the Grand, and after an unsuccessful attempt to force a crossing, attacked a body of about one hundred and fifty militia at Malcom’s Mills (Oakland) on November 6th. Canadian forces put up a spirited resistance but were overwhelmed. 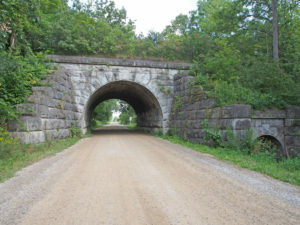 Glen Morris Road East – cut stone railway bridge constructed in 1854 by the Great Western Railway Company over Glen Morris Road East to link Harrisburg with Galt. It is a beautiful example of masonry work with its double arches with keystones which allow both the road and stream to pass under it. 359 Regional Road 35 (Blue Lake Road) – circa 1830 – Neo-Gothic style farmhouse – Adelaide Hoodless was born here in St. George, the youngest of twelve children. Her father died a few months after her birth. Her mother, Jane Hamilton Hunter, was left to manage the farm and a large household. Perhaps the hard work and isolation of her youth inspired Adelaide to take up the cause of domestic reform years later. After her schooling in a one-room schoolhouse, she stayed with her sister Lizzie while attending ‘Ladies College’ in Brantford, Ontario. While there, she met John Hoodless who was also the close friend of her sister Lizzie’s future husband, Seth Charlton. John Hoodless was the only surviving son of a successful Hamilton furniture manufacturer (Joseph Hoodless). Adelaide married John Hoodless and moved to Hamilton. Adelaide and John had four children: Edna, Muriel, Bernard and John Harold. 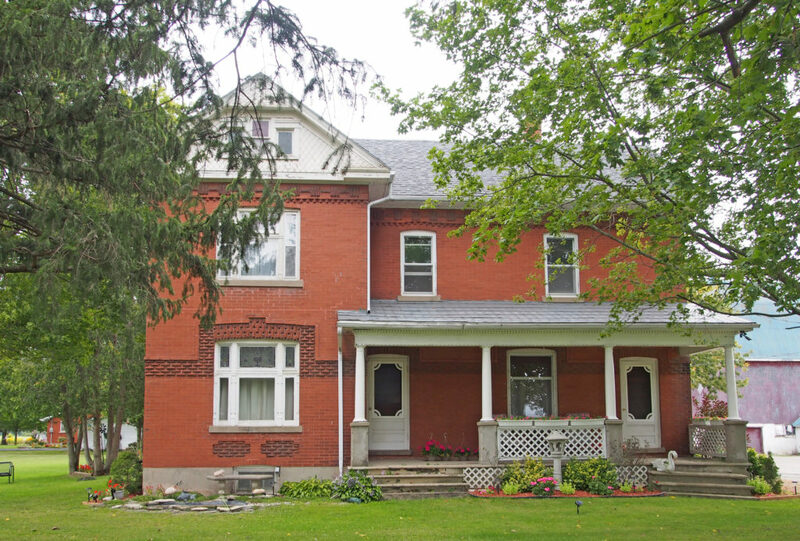 308 Robinson Road – Apps Mill – 1846 – The Apps family operated it as a flour mill using Whiteman Creek for power until 1959 when hurricane Hazel flooded the entire bottom floor. It has horizontal wood siding and six over six windows. 129 Oakland Road, Oakland – Built by Mordecai Westbrook, a member of one of the original families of Oakland. Georgian style with original double hung six over six windows and shutters. The walls are triple-bricked with bricks said to have been made on site. The widow’s walk and rear stone coach house are both original. 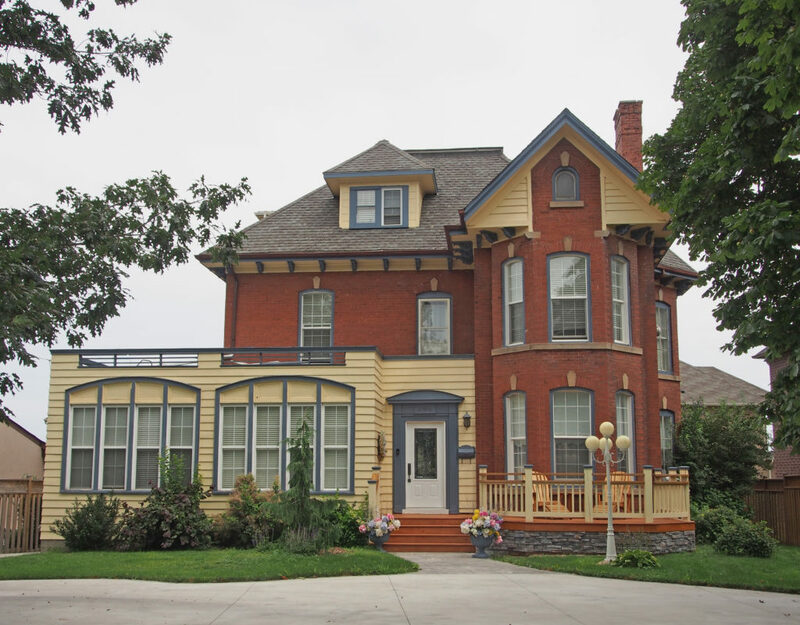 27 Talbot Street – 1890 – is an early Queen Anne style featuring a wraparound veranda with elaborate scroll work, spool work and patterned brick work with a string course at the frieze. Rusticated brick is used to ornament the principal window drip mold. Cornice return around the dormer bulls-eye window.